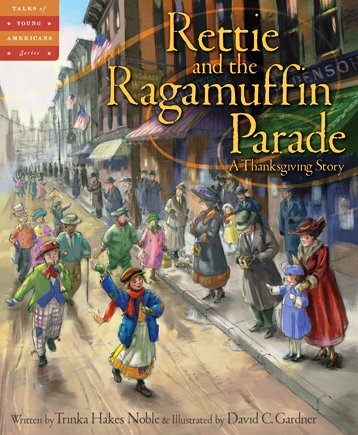 The human spirit is ever resilient, and nowhere is this more evident than in author Trinka Hakes Noble’s latest historical picture book: Rettie and the Ragamuffin Parade: A Thanksgiving Story. 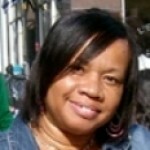 In the book, nine-year-old Rettie is not living the typical pre-teen life. Her mother is gravely ill, her father is away fighting in WWI, and it’s up to Rettie to care for her two sisters and her toddler brother. Rettie not only does all the cooking and cleaning, she even teaches her siblings their letters and numbers while she rocks her baby brother to sleep on her lap. One wouldn’t think life could get any harder…but it does. When the apartment manager is quarantined for having “influenza” and cannot clean the building, she is in danger of being fined. Rettie takes on the job of cleaning the stairs, railings and stoop and manages to earn a few extra pennies for her work. The only thing that keeps this hard-working little girl from giving up is the upcoming Ragamuffin Parade, an even where strangers toss enough pennies to ragamuffins to make a difference in their families lives. This is an amazing little book about determination and resilience of the human spirit. Any pre-teen, teen or young adult who has lived or is still living at or below the poverty line (or who knows someone who does) will easily identify with the domino effects of being without money and sound family support. Of note is the fact that the book seems (and actually is) very wordy as the readers opens to the first pages, but the inspiring story line and the fact that readers cannot help but cheer for young Rettie will soon make the wordiness seem of little consequence. Artist David C. Gardner’s illustrations capture the rural flavor of 19th century American life, including the dirt streets, the wooden sidewalks, and cowering young orphans huddling in the alleyways. Use this book in history class to open a discussion about the origins of holidays in America, or use it in health class as an example of the devastation of 19th century epidemics and pandemics. It can also be used to describe the back-breaking lives of children of the 1800s. Next articleWhy is Art Full of Naked People?